In Sydney city center there is much to do and to see. Click on the area to Zoom for more detailed maps. Amongst the many places to visit, there are attractions you can only find in Australia. The Rocks and Darling Harbour are two prime districts in the city that are on the must go list for visitors. Oxford St is a favourite with the gay community, while Kings Cross is good for families during the day, at night it is very much Sydney’s Red Light District. The restored historical district of The Rocks, at the foot of the city by Circular Quay, has cobbled streets, museums, shops, art galleries and restored buildings from the early 19th century. 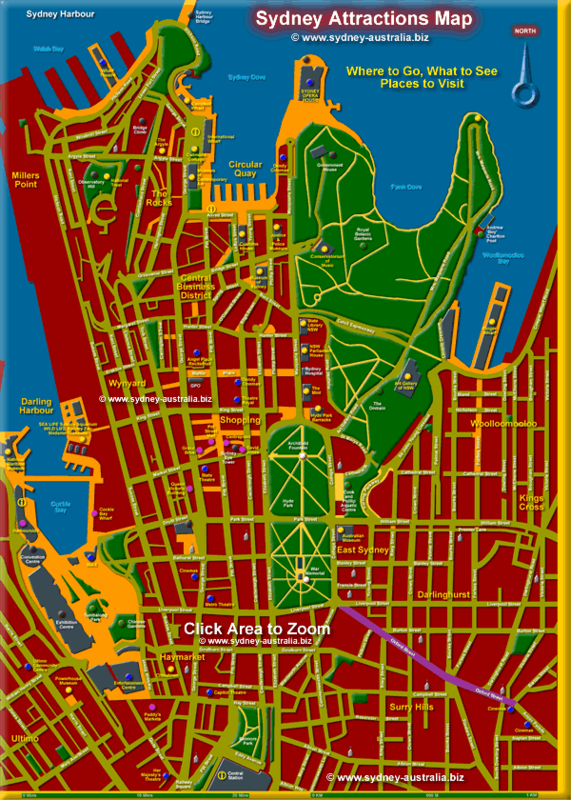 Attractions and Museums as well as other places of interest are marked with yellow circles. Entertainment centres are marked with blue circles. Note: There are free shuttle bus services that operate in Sydney city center. They operate in a loop to make it easy for you to get from Central Station to Circular Quay via George Street and the stops in-between. Look for the bus stops that display the shuttle logo (green), the buses are green with the route number 555. The premier city icon is the Sydney Opera House, with views of the harbour and the bridge. You can also get great views from the Royal Botanic Garden and Mrs. Maquarie’s Chair. Photo places are marked with a gray black dot, great for ’selfies’. There is a place to see the whole city cbd all at once and beyond: Sydney EYE Tower on the corner of Castlereagh St. and Market. Darling Harbour, touted as Sydney’s Premier Entertainment District is only a short walk away west from the center of the city. At Central Station, there is a Lightrail service to the Sydney Exhibition Centre and the Sydney Convention Centre. Chinatown, in Haymarket, is adjacent. The Sydney Harbour Bridge is a short walk away, with the Sydney Opera House located just on the other side of the Cove. The adventurous may want to try Bridgewalk, a walking tour that takes you over the top of the arch, with unparalleled views of the harbour city. Pedestrian places are marked in yellow orange. Darling Harbour has lots to see and do for the whole family: The Powerhouse Museum, the Australian Maritime Museum, the Sydney Aquarium and the Wildlife Center are all within easy reach. To get there: Take the ferry from Circular Quay to Darling Harbour, or catch the Lightrail from the city main train station. You can also just walk over the Pyrmont Bridge in the city center or from Chinatown in Haymarket.